Bikers burst with enthusiasm as they await their departure. Photo taken from 2013 newsletter. Ohio University senior organizational communications student Conor Emser rode his bike nearly 4,000 miles across the country, through the Appalachian Mountains, the Rocky Mountains, the highest paved road in the U.S., sat through two tornadoes and kayaked down the Mississippi, stopping only to build houses for those in need. Emser began this journey through Bike & Build, a non-profit organization that raises funds for affordable housing projects. Funds are raised through a three-month bike ride across the country supplemented by weekly build days in which members help build homes in communities. Emser applied his freshman year and after his acceptance he had only a few months to raise the required $4,500 and log 500 miles on his bike. Set to depart from Virginia Beach, Va. in late May, he arrived in Virginia Beach with only $4,300. Fortunately, last-minute donations came through and he was ready to embark on the journey of a lifetime with 28 strangers by his side. With their longest day at 114 miles, and their shortest day at 14 miles in the mountains, the group was up at dawn and at their destination by 5 p.m. each day. With an average distance of 70 miles per day bikers had the freedom to ride ahead or behind of the pack and were followed by a single van equipped with emergency supplies and personal items. Each rider was allowed only one small tub of personal items. “I only had four shirts, a pair of shoes, a pair of shorts, and I came with like seven pairs of underwear but I burned them all in Wyoming for warmth,” Emser said. Despite the rigor of the bike ride itself, participants also stopped at 10 cities along their cross-country trip. Partnered with Habitat for Humanity, an entire day was dedicated in each city to building homes, often alongside the recipients of the new house. “It’s sort of liberating when you know you’re only going to be there for a day and you want to get to know these people,” Emser said. 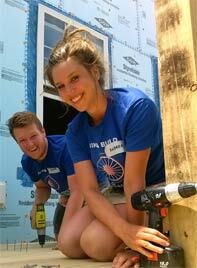 Emser and fellow rider work at a build site on their 2013 trip. Photo from 2013 newsletter. Whether it was a day of volunteering or of cycling, riders concluded the day upon arriving at their host locations and often exchanged info sessions on local affordable housing for a meal and a night of shelter. Prior to the trip Emser trained by cycling on campus. He mentioned that Jeff Hill was a go-to for hill training; however, in the end it was dramatically different than cycling up a mountain. “I didn’t realize that for six hours I would be going straight up Jeff Hill in the Colorado Rocky Mountains,” Emser said. According to the Bike & Build October 2013 newsletter, a total of 286 riders traveled nearly 920,000 miles. Bike & Builders contributed with 119 completed build days. The 2013 trip raised enough funds to donate more than $500,000 to nonprofits around the U.S.
Emser was able to donate $500 back to his local affordable housing services in Cleveland, Ohio. His team of 29 people raised approximately $150,000, which was also donated. Over the course of Emser’s trip on the Central U.S. route his team visited 10 different sites and built a total of 14 family homes. While on the Bike & Build trip Emser was inspired by a friend and the Mississippi River to found his own variation of Bike & Build: Paddle Home. “While we were standing in St. Louis over the Mississippi River on a bridge and I was like, ‘I totally want to kayak that,’ said Emser, and so he did. Emser gathered a small group, bought a truck for $400 and set out on the journey that was to be known as Paddle Home. Although not one of the participants possessed extensive kayaking experience, the group of four kayaked just under 2,400 miles in 55 days. “The first time I ever kayaked in my life was when it was sitting in the Mississippi River,” Emser said. He also expressed his innate fear of open water and his lack of confidence in his own ability to complete the extensive trip. “That trip was incredible in the sense that it shouldn’t have happened and it shouldn’t have made sense and somehow it happened,” Emser said. Although the trip was successful, it didn’t come without obstacles. Emser sat through the second tornado of his lifetime while in Iowa on the Paddle Home trip. Paddle Home raised $3,500 over the course of the trip and was able to donate $2,000. After graduation Emser hopes to make Paddle Home a sustainable non-profit organization. Emser indicated that he wants to do Bike & Build again, this time as a leader. He applied to participate in the upcoming summer but was restrained by an injury. Emser was able to contribute to the 2015 donations when he helped fund Ohio University senior Chloe Gebacz for her upcoming trip. Gebacz will follow Emser’s footsteps, or rather tire tracks, this summer. Gebacz is set to depart from Virginia Beach, Virginia and embark on the Central U.S. bike route on May 25. As a former study abroad student Gebacz is no stranger to adventure. Her route will begin in Virginia Beach, Va. on May 25 and conclude in Canon Beach, Ore. in early August. She is eager to depart, however nervous about the mental and physical demands of the trek. In preparation Gebacz participated in the Ohio fit club, a 12-week workout program. She also spins at OU’s Ping Center and bike rides daily. Relatively confident in her physical preparation, Gebacz shared her reservations about the mental isolation. One of her largest concerns is the restriction of headphones while riding. She expressed her anxiety about pedaling nearly 4,000 miles across the country in silence, however she recognized what a unique opportunity the mental isolation presents. “I know it will be a good thing in the end,” Gebacz said, assuring herself. Gebacz made the decision to apply for Bike & Build after a former employee encouraged her to take the opportunity to do anything she has ever wanted to do right now while she’s able. Gebacz’ family was surprised at her decision to join Bike & Build. “My mom told me I was crazy and my dad told me that it sounded miserable,” Gebacz said. Gebacz has raised $3,700 of the required $4,500 to be ready the day of her departure. She intends to continue logging hours on her bike and attempting to physically and mentally prepare herself. “There are so many things that I am nervous for but when else am I going to do this,” Gebacz said. Thank you for a great post about raising additional funds to build houses, it’s very useful for me information.